So as I hope you all know, the Hajj is a religious pilgrimage that Islam requests all its believers to participate in at least once in their lifetime if possible. Now I know that there have been many incidents such as stampedes where lots of people have died during the Hajj, but this applies to everybody no matter their ethnic origins. It's just hard to maintain perfect safety with so many millions of people. But I have also heard or read of Western "tourists" getting into trouble there. Of course non Muslims are not allowed to go to participate in the Hajj, to go to Mecca at all, and it's very difficult for them even to get into the country. But people have done it anyway and I recall the story of a German man in disguise in a woman's burqa that the crowd found out to be a non-Muslim and killed him. This makes me think it would not be easy to be somebody obviously from a part of the word not majority Muslim in the midst of the crowd there. But there are very many people who have converted to Islam all over the word and they are still of course asked to participate in the Hajj in their lifetime too. But is it safe to be a "westerner" at the Hajj even if you're a devout Muslim? Have their been incidents? Should you try to look "as Muslim as possible"? How should a Muslim (by conversion) who is from a Christian (etc) country try to dress, act, and behave to make the pilgrimage as safe as possible? I was raised and spend 18 years of my life in Madinah which is the second holy city for Muslims and it is so close to Makkah (A.K.A. Mecca). These two cities have similar rules and mostly all pilgrims visit Madinah either before or after Hajj so I am answering this out of personal experience and observation and not influenced by the western media. The point of Hajj is to unite Muslims and put them in the same level, poor and rich, white and black, king and janitor.. etc hence people in Hajj are to wear the same simple clothes and go to the same places all together. In other words the major point of Hajj is to remove racism! so no way that a pilgrim would harm any other pilgrim according to his/her race during Hajj!! That would be against the main reason of Hajj. 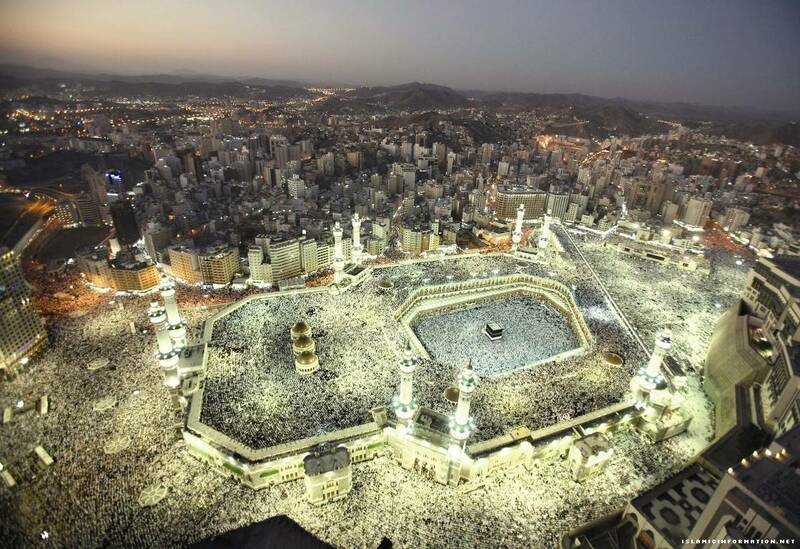 As you can see in the photo above, more than two million Muslims from all over the worlds are there at the same time. Do you think they would have gathered if it isn't safe?? and FYI, if performing any Islamic worship might harm you by any mean, then you are not required to perform it. Also, In Madinah there is the Islamic University and there are many Muslims from the west and some of them used to live in the same neighborhood where I lived and I do not recall any problems happened to them. Actually if any one comes to Mecca or Madinah he/she will be surprised to see that people from all over the world are everywhere (like in time's square). Any way local people in Mecca and Madinah are used to seeing people from all countries and they do not even pay attention to either westerners or easterners! Regarding safety of westerners in Saudi Arabia in General (Mecca is part of Saudi, So the safety of SA reflects on the safety of Mecca) it is safe otherwise there wouldn't be many westerners here. I am aware of some problems in the past but that was general problem to all people not to westerners only but the western media concentrated on the western victims so some think the problems are after westerners only. FYI, there are many westerners where I work and I never heard them complaining about safety. One more thing, crime rate is low in Saudi Arabia. All road signs are clearly marked in English and Arabic. Make sure you carry with you the identification documents for your hajj hamla (caravan). English is not an issue when walking around the Haram, as most shopkeepers will speak multiple languages. However, knowing a few phrases in Arabic will help you greatly. A successful Hajj is a point of pride for Saudi authorities so they are especially vigilant and on alert at this time - this is good for the millions of pilgrims that arrive annually for this event. Safety is a paramount concern for them. Keep in mind that not everyone there is out for a noble cause. I have heard many stories of pickpockets walking around - and they are especially in force during Hajj and Ramadan. This also happened to a few relatives. Keep your wits about you. The authorities are quick to stamp these out though, and that's about the worse you can get - but it can be expected whenever there is a large gathering of people anywhere. But is it safe to be a "westerner" at the Hajj even if you're a devout Muslim? Have their been incidents? Should you try to look "as Muslim as possible"? How should a Muslim convert from a Christian (etc) country dress / act / behave to make the pilgrimage as safe as possible? You can forget the dress part, since everyone there for Hajj will be dressed exactly the same in the ihram which is two piece of white cloth for men, and a simple dress with no embellishments for women. You can't look any more "muslim" during the Hajj. I have been to Haram many times and Makkah (Mecca) in general. There are Muslims from all parts of the world and all walks of life there. As the area is especially sacred for Muslims, there is very little in terms of violence but incidents do happen. These are usually around Hajj time when you might hear of stampedes and so on. Other than, since its a large city there are normal issues with a city of its size; traffic, road construction (which happens at a breakneck speed), etc. I have yet to hear of any incidents especially targeting Westerners in Makkah or Medina. If you fear for your life, you should not perform Hajj as your experience will not be one of devotion and prayer. Its not an easy task (the Hajj) so you should be as prepared and relaxed as possible to perform it. I did pilgrimage Three times until now. Most of them were converted. I was like their group leader, and we did all the activities together (going around mecca). I visited more than 50 cities in more than 12 countries and mecca was the most safe place even for my Western friends. Most of them happen because of the failures of crowd control, but his is from the past now. Things are different now. everything became more organized in the last years. Saudi Government spend billions to make the hajj more organized, still there is one bottleneck which is "altawaf" and there is ongoing project to enhance it with budget more than 4 billion dollar. Should you try to look "as Muslim as possible"? No you shouldn't, some of my western friends during hajj was having big tattoos and everything you can call it western style, and it was OK and safe for them. "There is no god but one(Allah), and Mohammed is a messenger from Allah"
If some one say this sentence and believe in it he became a Muslim. it's called Thob, but you can wear whatever you want. 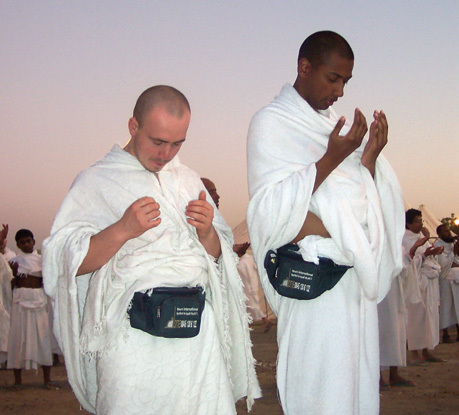 is it safe to be a "westerner" at the Hajj even if you're a devout Muslim? Not the answer you're looking for? Browse other questions tagged safety saudi-arabia islam mecca pilgrimages or ask your own question.